Debut author, Tahereh Mafi delivers a knockout of a book. I was lucky to get a copy of this at this past year's BEA and devoured it as soon as I could. Juliette hasn't touched anyone in 264 days, because when she does it's lethal. And due to her lethal touch, Juliette has been imprisoned by The Reestablishment. But now The Reestablishment wants to use her as a secret weapon. As Dystopians grow and we get different versions of a world that is bleak and terrifying, Tahereh also gives us a simple love story. Before Juliette accidentally killed a boy by touching him, she was infatuated with a boy named Adam. Adam is introduced to us in a way that you don't think he would be the love interest of a girl who could potentially kill him. One think I also really liked about this book was the big bad, Warner. A young ferocious military guy who wants to use Juliette as a weapon and possibly something else. The power struggle between Adam and Warner is palpable. But when Juliette slips up and manages to touch Warner without killing him, Warner will do anything to have her. My only problem with this story was the very very end. I won't spoil it but it kinda surprised me. 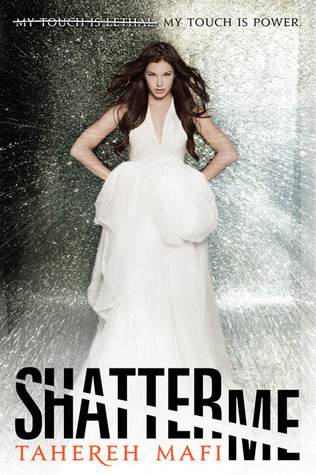 Shatter Me is out today in bookstores and you can purchase it at your favorite store!